I am a pumpkin fiend. When fall rolls around, I get so excited about all of the delicious things I'm going to eat - pumpkin muffins, pumpkin scones, pumpkin ravioli, pumpkin risotto, pumpkin bread. And of course, pumpkin cookies. I had never tried making my own pumpkin cookies, so last weekend I bought a couple of cans of pumpkin and Sam and I tried our hand at it. 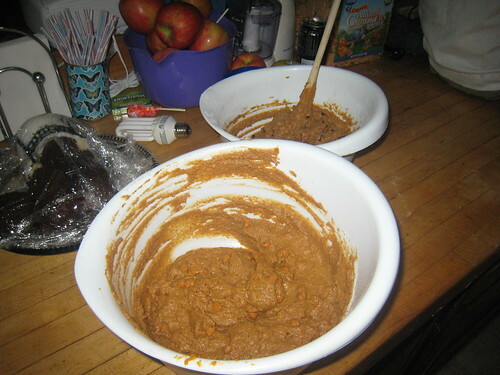 I looked online for recipes, and almost all of the ones I found said this: Mix a box of spice cake mix with a can of pumpkin and some chocolate chips. Which I guess is fine, but I really wanted to make some from scratch. I was also looking for a recipe that I'd know the Weight Watchers points for because, well, I need to reign my sweet tooth in a little. I finally found a recipe on a Yahoo message board that seemed easy enough AND included the awesome tidbit that these were only one point per cookie. Grease large baking sheet with non stick cooking spray; set aside. Stir flours, sugar, baking soda, cinnamon, cloves and ginger in large mixing bowl until well combined. Mix pumpkin, egg and syrup in a small bowl. Add to flour mixture and beat until well combined, but do not over mix. Scoop 2 tablespoons dough onto baking sheet. Flatten with moist spatula or fork. Bake 15-17 minutes or until browned. The recipe makes about 30 cookies. 81 calories per cookie, .3 g of fat, and 1.4 g of fiber. 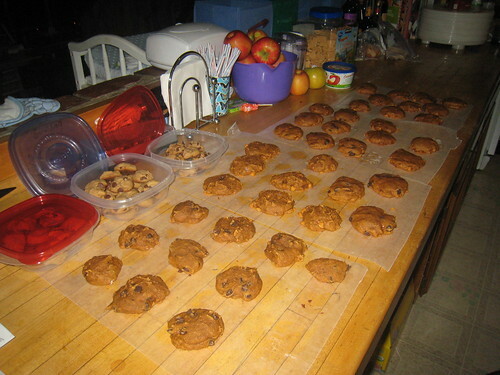 I doubled the recipe and made one batch with chocolate chips and one with butterscotch chips. When scooping the cookies onto the cookie sheet, I found that instead of using a spatula or fork to flatten them it was easier to just use my fingers. The dough is VERY sticky, so you need to dip your fingers into a bowl of water first to squish/shape them. They don't rise much while baking, so the shape they're in on the pan is pretty much how they'll come out of the oven. The butterscotch ones taste really good, but the consistency of the chips caused problems because they melt quicker than chocolate chips. When I make them again, I'll make them without the chips, then melt the butterscotch chips in the microwave and drizzle over the cooled cookies. Since I added chocolate/butterscotch, I counted these as 2 points per cookie. They are a delicious fall/Halloween treat! It would be really fun to make Jack-o-lantern cookies with this recipe, you'd just need some black icing. I think maybe next year I'll do that! Make sure to head over to the SITS Girls website today to check out tons of creepy, crawly creation ideas! This look delicious! I will have to try making them:) yum! !